Today I entered edit #28310489, which ended up with the last two tracks (11 and 12) being in the wrong order. It looks good in the edit form, but in the raw edit date one can see that both track 11 and 12 share the position 11. 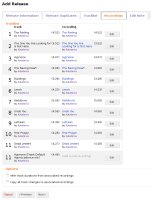 After the release was created MusicBrainz showed track 12 before track 11 in the track listing (see edit #28311474. 1. I searched for the Disc ID KUtROId8zwUHcQa0R9J5_6INwIk-, which was not already in the database. this Disc ID has 12 tracks. 2. I selected "Add new release"
4. The system warned me "You have selected some Disc IDs that aren't matched to any mediums. If this is wrong, use the "Attach Disc ID" options below." 5. In the "Attach Disc ID" dropdown I selected the Disc ID. As this disc ID has one more track the system automatically added a new track with the number 12 for which I entered the title. 6. In the next step ("Recordings") the last two tracks are already numbered "11". When submitting the release the last two tracks got the position 11. See also the attached screenshots. I did not test this on beta.